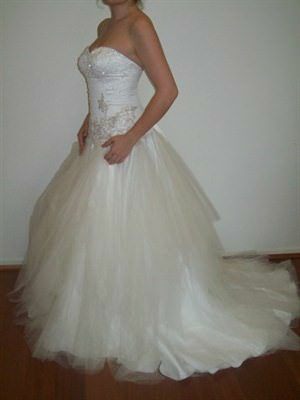 NEVER WORN, was $2850 now $995.<br><br>Special one-off design by Wendy Sullivan for her "Brides Desire" collection (under the "Airs & Graces" label).<br><br>This stunning ivory satin ball gown features a figure-flattering, dropped-waist bodice with gorgeous sweetheart neckline, lace-up back, and swarovski crystal beading and antique-style lace detail. 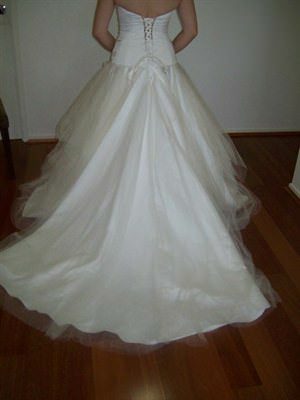 The full satin skirt is under beautiful layers of tulle and features a chapel-length train that can be bustled for the dance floor. Wear this dress over a petticoat or hoop for that breathtakingly beautiful princess look, and be sure to have some photos taken while you're sitting down with the fabric flowing around you-- gorgeous!<br><br>The tag lists this as a size 10, but the corset-style back and full skirt means that it could easily fit up to size 14 without alteration. The bodice also offers superior support for "the girls" without need for a strapless bra, and the optional modesty panel can be tucked away to reveal a little more skin behind the lacing.<br><br>This dress has never been worn (except for in-store and while taking these pictures) and the sales tag is still attached; it does have some minor staining along the bottom of the hem, presumably from being tried on by others in the store, but that could be easily dry-cleaned away if need be.<br><br>In these pics I am a size 10 (c-cup), 173cm tall, and not wearing shoes or a hoop under the skirt.<br><br>This dress is perfect for your fairytale wedding-- you can't help but feel like a princess while wearing it, and it's fun to swish around in, too! More pics are available by email, and trying-on can be arranged at flexible times in either Coorparoo or New Farm (Brisbane).